Don’t have anything scanning your emails for viruses, SPAM or Ransomware infections? Do you have in-house scanning and want to add additional external protection? Our Email Security solutions offer scalable affordable hosted Anti-Malware email protection that is compatible with any email infrastructure including Office 365, other Exchange online services and Google Apps. With highly effective cloud-based filtering our service blocks spam and email-borne threats before they reach your network. We’ll also scan your outbound mail so that you won’t get blacklisted if anything nasty happens. 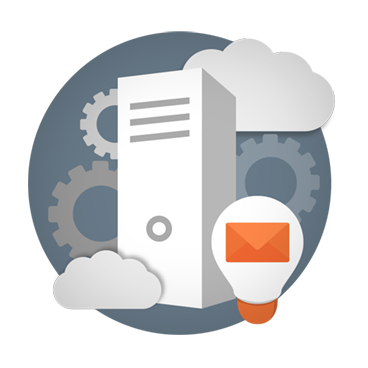 With our services you’ll overcome issues like spam, virus attacks and lost emails with our managed email services. Where you host the window to your business is an important decision. There are plenty of free hosting providers but what do they provide you other than the host? With PurpleJelly hosting, after parking your domain our service will offer performance and scalability, cost effectiveness, a 99.7% uptime and of course the assurance of the awesome PurpleJelly IT Support. We’ll also look after the domain control and renewal. If you benefit from our IT Support plans you might even get this service for free. If you don’t, we can add the charge to our single billing system and spread the cost over the whole year providing very small monthly bills. We currently have space in two datacentres within 20 miles of our office’s here in Farnham. Both datacentres are Tier 3 data centres providing cold aisle cooling and energy efficient power backups. These datacentres are perfect for co-locating some or all of your infrastructure equipment, virtual machine hosting and VMware hosting. Generators that hold a weeks’ worth of oil which will effectively power the whole centre. Help employees stay productive with common-sense web browsing policies designed for the workplace. Protect the business from legal liability and reduce the risk of a security breach through proactive internet access controls. Not only that but you will be able to report across all the users and work out particular patterns of browsing behaviour. PurpleJelly also offer a Mobile Device Management (MDM) service which can be deployed to any or all of the mobile devices that connect to business data such as email and centrally stored data. Our MDM service covers iOS, Android and Windows phones, and each device can be managed via our own dashboard. The service allows you to ensure that critical data held in emails etc can be safeguarded and will also allow you to monitor apps and device usage on a device by device basis.